The Sustainability Office is integrating sustainability into Campus Planning and Development by leading the development and implementation of campus policies, including the Integrated Rainwater Management Plan (IRMP), a technical framework developed to support a key recommendation of the Whole Systems Infrastructure Plan (WSIP). Examples of the IRMP implementation through capital projects currently underway are described below. 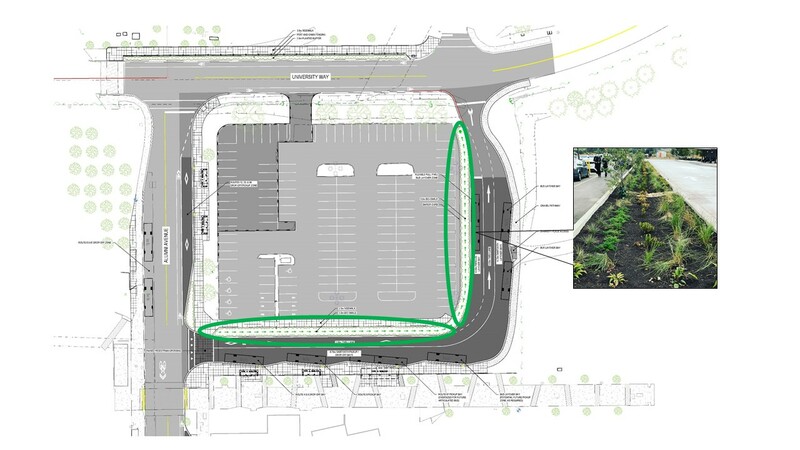 Bioswales have been incorporated into the new transit exchange project. A bioswale, or swale, is a low tract of land that is either natural or human-created. A swale is designed to manage runoff, filter pollutants, offer some degree of temporary storage, and increase rainwater infiltration.